Amongst the interviews we make, we didn't have the possibility yet to talk to somebody close and even if this time the victim is from a neighbouring country, we can almost consider him a compatriot. Somebody who doesn't like to show off before hand. He only talks about his projects when they are financed. He moves within our circles and shares all his good deeds with all of us in different ways, above all doing what he likes most and what we like most , games and good ones!!! Sandro Mestre or Woodmaster or simply Wood began already when he was a very young being interested in all which could be connected to a TVset and which had keys. Now we can consider him already an advanced programmer and he has the kindness of celebrating every new game which we all play. 1 - Tell us about Woodmaster / Algarbi (Sandro Mestre), Who are you? 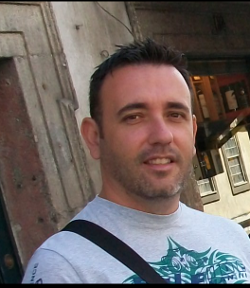 I am 39 yo and I live in the Algarve, south Portugal with my wife and son. I love to code for retro computers. 2 - What and when was your first contact with a computer? 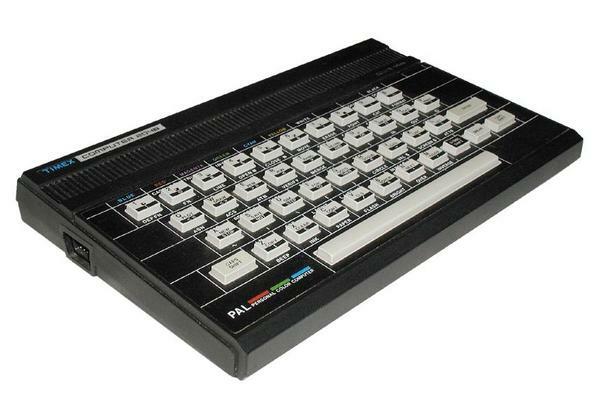 When I was 11 or 12 I friend of mine had borrowed a 48k zx spectrum from a cousin and we started to code in basic on it. The next year I got myself a Timex 2048 which was produced in Portugal - it was a speccy clone but had 3 extra screen modes. 3 - Can you remember which was your first game? I think it was Manic Miner. 4 - Why the Commodore 64? ¿What throw you to this one and no other more popular at the time? As I have already told above my first computer was a zx spectrum clone, and I was actually quite happy with it and I had already moved to code it in z80 assembly, I was also an avid reader of the spanish magazines Microhobby and Micromania. Micromania was a magazine which reviewed game for different platforms (speccy, cpc, msx, c64) and I was getting interested in all these other computers with their 'strange' graphic modes where they had brick pixels and more colour per attribute cell(as I saw it then!). Then someone opened a new computer shop in town that was selling only commodore computers and they had one on display and it was running the game and I confess it was love at first sight lol. They had other games also on other days, like Cybernoid II, Fernandez must die etc. So I just had to have this computer. The first C64 game he saw. 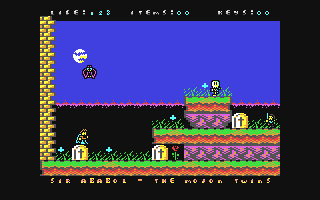 5 - How do you rtart to do the C64 conversions of the Mojon Twins games? At one time we were all members of the Computer Emuzone development forum and it was there that it all started - I started to port Nanako then. Afterwards I came across their games and I liked Uwol a lot and I saw that there was a Sega Genesis/Megadrive port already so I asked them if they would be interested in a c64 version and they said yes, the same applied to Sir Ababol. 6 - What tools do you use to program? Do you program directly on a C64 o use you a PC? I did start to code on the real machine, first in basic and then I was very lucky to find the book "Commodore 64 Programer's Reference Guide" and moved to machine code. Some time later I was able to buy other two books, "Cómo programar su Commodore 2 - Lenguaje Máquina, Entradas .Salidas, Periféricos" and "Commodore 128" both printed by Paraninfo. At 2001 I started to use emulators and cross platform tools to program. At the moment I use the following tools: cc65 C toolkit which includes the ca65 assembler; KickAssembler; CharPad; SpritePad;ProjectOne; Timanthes; Vice emulator. 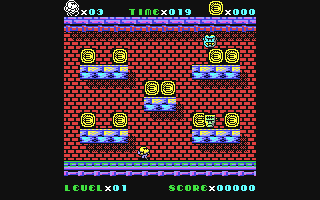 Nanako, his first C64 release. 7 - In what games on the C64 has you been involved and what do you do on them? Until now I was involved only as a coder. Nanako in classic japanese monster castle(100% assembly); UWOL Quest for Money(C+ASM); Sir Ababol(C+ASM). The one I like the most is UWOL perhaps because it is the one I enjoy the most playing. I confess that I used to like to play much more than now but I still do play a bit when I like the game - I enjoy much more coding. I do not play much the games I have coded perhaps because I had to beta test them all the time. The game I always come back to play is UWOL. It is a very nice sensation to play the games I have coded but I I think it is a much better feeling still when I know that others enjoy the games. 8 - In which titles are you now involved? I have many projects started on the c64 and other platforms but those I would like to finish in a near future are Illogical and Teodoro. I have also started another project which is in it's design phase still, it isn't a version of other game in existence. The provisional title is Castrum Strigium. UWOL and all the family. 9 - What are your favorite genres in computer games? I like several genres, mainly adventure, rpg,shmups and platformers. 10 - What computers have you used and you still own? 11 - What do you think about the death of the 8 bits and the C64 and how do you see this growing passion about the computer and game history? I don't think they have died at all - they have just moved to another plane of existence ;) . They are more mature now and I am still amazed how can people still squeeze new stuff from the c64. I have seen also many new projects either games or demos for other retro machines like the msx, spectrum and cpc and they also are doing very well with many new releases for them. 12 - Do you have some no finished games? Do I really need to answer this? HAHA I have tons of stuff here that I have started and need finishing. Some of them I don't think I will go back to them but others might have a chance. Sir Ababol, his lastest release. 13 - Do you feel some pressure to end the games that you0re working on? I do feel some pressure only when I have some material from the other friends involved in the same projects waiting to be used. 14 - Have you be the intention to do a solo project or something really big? Of course, I have started some projects of my own, but these take more time that's why I have been working on versioning. Yes I do have some big projects in mind and some in paper that would require cartridges of 128k or more. 15 - What do you think about modern games? ¿Have them all less feeling that before? I am not a huge fan of modern games. The only games I have played with gusto was Oblivion and Skyrim. I do try other games from time to time though. 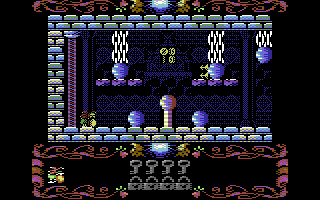 I think that most new games are very good gfx and msx wise but have lost a lot of the magic of the first games, their playability and also many are very easy. Teodoro, with the 2 possible versions. 16 - Do we see you in Retromadrid someday? I have not lost hope of attending this great fair, I have thinking of going for sometime now but it got more difficult since there no more (cheap) direct flights from the Algarve to Madrid. 17 - Have you another hobbies? Yes I do, a lot of them actually, I think I should narrow a bit my hobbies: reading, learning other languages, painting. 18 - Thanks to answer our questions!. Would you likje to add something more? It is me who should thank you for this opportunity. I would like also to thank all those who have worked with me or have morally supported me in all the projects we have worked together. Working in the aforementioned projects allowed me to know a lot of people and make some good friends. You can buy Woodmasters games on cartridge at RGCD. You can buy Woodmasters games on TAPE or DISK at Psytronik. You can visit the Mojon Twind Dome HERE. You can visit INSIDE HERE.